Now you can have your very own leader of the Autobots with the Metal Earth Transformers Optimus Prime 3D Model Kit. This meticulously detailed, etched model is assembled from two 4-inch square steel sheets and finishes as a 1.77-inch x 1.22-inch x 3.46-inch 3D model. Builders are required to pop out individual pieces from the sheets and connect them using provided tabs and holes. While no glue or solder is needed for fabrication, Fascinations does recommend keeping a pair of mini clippers/pliers on hand for some of the more delicate aspects of the assembly. 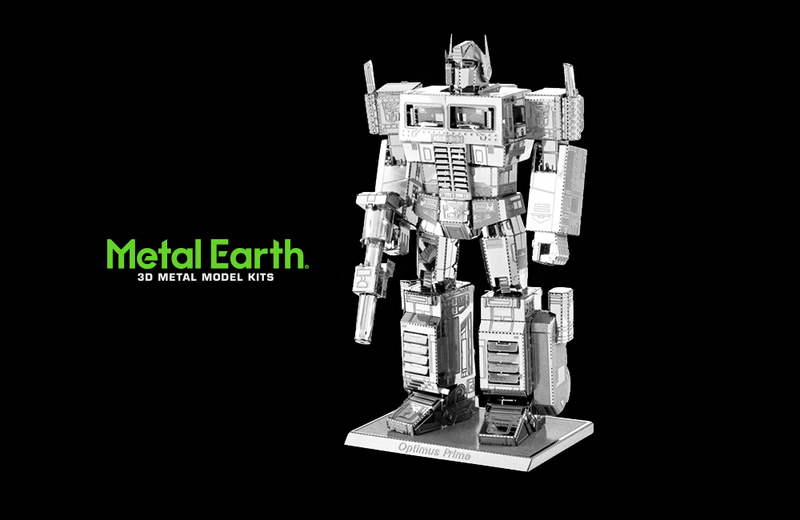 The Metal Earth Optimus Prime 3D Model Kit is available now at a variety of online retailers and checks in with a list price of $11.99 USD. To complete your Transformers collection, Fascinations also offers metal versions of Bumblebee, Soundwave, and Megatron. All models in the series are aimed at kids ages 14 years old and up. Arm-chair sleuths can solve millionaire murders in the lap of luxury with the Clue Luxury Edition from Winning Solutions. The Pikachu Itazura Bank adds a dose of fun to the often dreary task of fiscal responsibility.